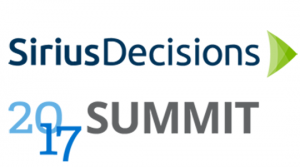 Point of Reference, a Salesforce® partner and Customer Powered Alliance member, is pleased to announce its sponsorship of the SiriusDecisions 2019 Summit running May 5-8 at the Austin Convention Center in Austin, TX. Point of Reference, a Salesforce® and Customer Powered Alliance partner announced that David Sroka, CEO of Point of Reference, will be giving a workshop on executive engagement at the upcoming The Summit on Customer Engagement. Sroka’s workshop entitled Capturing CXO Engagement for Customer Advocacy Success will be on Friday, March 15th. The session will give CAP Managers and Directors the practical tools and a step-by-step guild for achieving powerful alignment with corporate goals and C-suite engagement. Point of Reference, along with Influitive, Sendoso, SurveyMonkey and TrustRadius have joined forces to evangelize and enable customer powered movement. Alliance members believe that organizations that integrate customers into every practical aspect of their business are more successful, and each offers solutions to achieve that goal. The B2B Marketing Exchange event was a perfect opportunity to launch the Alliance. The inaugural Alliance-sponsored event included Alliance leadership and marketing executives from 20 businesses, was an opportunity to share ideas and examples of how their organizations were taking “customer obsessed” to the next level. Future events, including webinars, executive breakfasts and more, will be announced shortly. Point of Reference is proud to be part of the first-ever Influitive Advocamp Field Day taking place October 2-4 in Toronto, Canada. This Influitive customer event will have both a physical presence in Toronto, and a virtual presence for a global audience via live streaming. Join us, one way or another, for a variety of AMP Talk speakers covering a range of subjects all designed to inspire and share best practices with customer advocate marketing professionals and aspiring professionals. One of those talks will feature a mutual client, Genesys, provider of world-class contact center technology solutions. Learn how to leverage the fruits of your advocate community to feed the sales enablement engine that demands relevant, timely customer references that drive revenue. We are pleased to be named a top 10 enterprise CRM solution for 2018! The profile on Point of Reference and our 100% Salesforce® native app for customer reference management, ReferenceEdge® is in the magazine’s April 2018 issue. Thank you for the recognition Insights Success, the best business magazine for enterprises! Read the article. Point of Reference, a Salesforce® partner, announced today their 11th consecutive year of sponsorship participation in the Summit on Customer Engagement. Point of Reference will share the podium with its customer, Lexmark at the 3-day conference running March 5-7, 2018 at the Sofitel Hotel in Redwood City, California. Point of Reference to sponsor at Influtive’s 2017 Advocamp event in San Francisco, CA December 6-8. A pre-built integration between the AdvocateHub and ReferenceEdge is available to mutual clients. 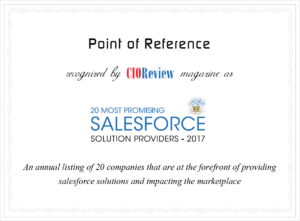 Point of Reference has been named as one of CIOReview’s “20 Most Promising Salesforce® Solutions Providers” for a second year in a row! The profile on Point of Reference and our 100% native app for customer reference management, ReferenceEdge®, is in the magazine’s June 2017 Salesforce issue. Thank you for the honor CIOReview! The Salesforce provider section starts on page 14. We’re featured on page 49. Read the article. Learn more. Reserve your spot! For the 13th contiguous year Point of Reference will be sponsoring and participating in the Summit on Customer Engagement March 6-7 in Redwood City, CA. This is the largest educational and networking event held annually for professional customer reference/advocate program leaders. 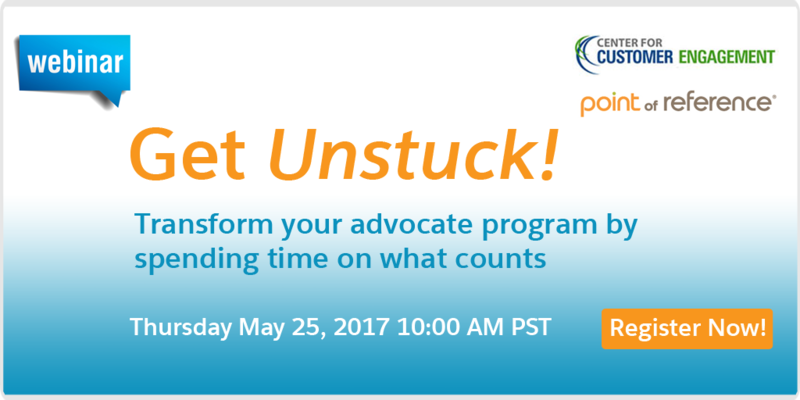 Whether your company has an established program, or you’re leading an effort to build a new program, this is a must attend event. Don’t reinvent the wheel and lose valuable time, learn from your peers. Point of Reference clients are eligible for a sponsor discount. Contact us to learn how it works. Point of Reference, a leading provider of customer advocate program solutions, announced Shared Contacts capabilities as part of the two most recent quarterly releases of ReferenceEdge℠, the only customer advocate management application native to Salesforce®. 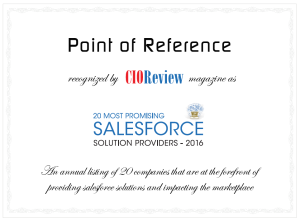 Point of Reference today announced it has been recognized as one of CIOReview’s “20 Most Promising Salesforce® Solutions Providers of 2016” in the magazine’s October 2016 issue for its Salesforce native application, ReferenceEdge®. Read the press release. Point of Reference, a leading provider of customer advocate program solutions, today announced the release of a new User Rewards feature for ReferenceEdge®, the only native customer advocate management application for Salesforce®. This new functionality enables employees, users of ReferenceEdge, to accrue points for completing a variety of activities in the application. Point of Reference, a provider of customer advocate program solutions, today announced the multi-point integration of its customer reference management application, ReferenceEdge, with the Gainsight Customer Success platform. The integration allows information to flow bi-directionally between the two applications so that reference management and Customer Success teams can both benefit by having access to information created and managed by the other team. If you’re planning on attending the Gainsight user conference in Oakland, CA May 10-12, at the Oakland Convention Center look for us at the main booth, partner area. Point of Reference recently completed a collaborative project with Gainsight resulting in a multi-point integration between our respective technologies. This initiative was largely accomplished through the Gainsight Rules Engine because ReferenceEdge℠ is a native application for Salesforce®. We see tremendous synergy between customer success teams and customer advocate teams and this integration will help our mutual clients do a more effective job of incorporating customer advocate stories and perspectives in a higher percentage of opportunities. The result being a higher close rate. Point of Reference, a provider of customer advocate program solutions, today announced the integration of its 100% native Salesforce technology, ReferenceEdge, with the AdvocateHub platform from Influitive. The integration enables customer advocacy program managers to access consistent data in both applications, which reduces the need for manual reporting and allows managers to spend more time on serving advocates. The new capability is immediately available from Point of Reference. For the 12th straight year Point of Reference will be exhibiting and presenting at the Summit on Customer Engagement March 1-2 in Redwood City, CA. This is the most important annual event for professional customer reference program leaders to exchange best practices and cultivate invaluable network connections. Point of Reference clients are eligible for a sponsor discount. Contact us to learn how it works. Point of Reference’s ReferenceEdge℠ is among the first 20 wearable apps announced by Salesforce.com. Enterprise wearables are here! Docurated compiled a list of its top sales automation tool picks and ReferenceEdge℠ made the cut. Spring release of ReferenceEdge℠ features new functionality that systematically identifies leads for the customer reference program based on Salesforce opportunity data. New functionality included in the Winter release of ReferenceEdge℠ provides customer account owners with regular, automatic reminders to check and update customer reference information via Salesforce Chatter or email.